There is nothing in the world like chocolate. You know what I mean? If humans could live off of chocolate I’m pretty sure that we all would. (Perhaps with a side of bacon thrown in here and there?). 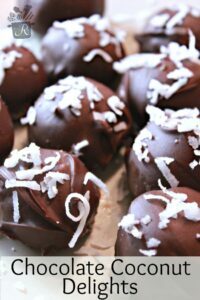 These Chocolate coconut delights are nothing short of heavenly and they are pretty simple to make too! Great for a party or even just everyday snacking. We don’t judge. Mix confectioners sugar, butter and sweetened condensed milk in a large mixing bowl using a sturdy spoon. 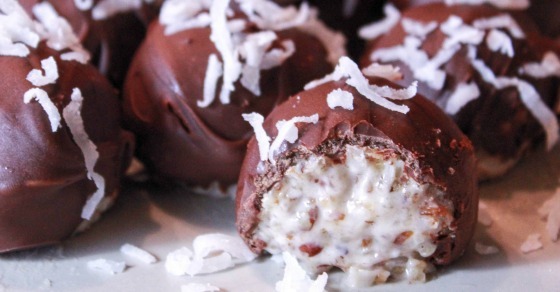 Mix in coconut, pecans, salt and vanilla. Tip: chill cookie sheets as well to help keep candy from softening and losing shape. Roll contents of bowl into small balls and place on cookie sheets. chill for 20-30 minutes or until very firm. If you do not own a double boiler, you can also melt chocolate in a small pot on the lowest heat setting, stirring constantly. Remove from heat when chocolate is melted completely. 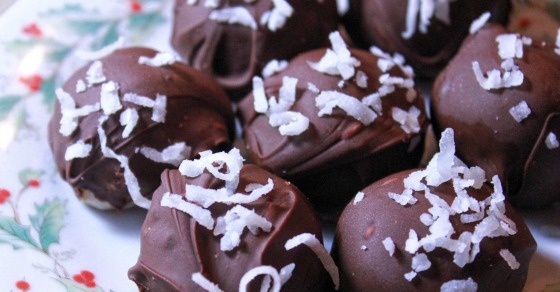 Using a toothpick, dip candy balls into chocolate and place back on chilled cookie sheet. Chill for another 20-30 minutes to harden chocolate. Need more party/late night goodness? Check out our no-mix margarita recipe! You won’t regret it.